U.S. Attorney General Loretta Lynch will visit a mosque in Northern Virginia next week amid a sharp increase in hate crimes that target Muslims. Lynch is scheduled to visit the All Dulles Area Muslim Society Center, aka The Adams Center, in Sterling on Monday morning. She will travel to New York the following day for a discussion with gay, lesbian and transgender youth at Harvey Milk High School, and to visit the Stonewall Inn and Stonewall National Monument. Many Muslims in the D.C. area are nervous about how President-elect Donald Trump will affect the community. News4's Chris Gordon reports from Sterling, Virginia. Lynch has said the numbers should be "deeply sobering for all Americans." 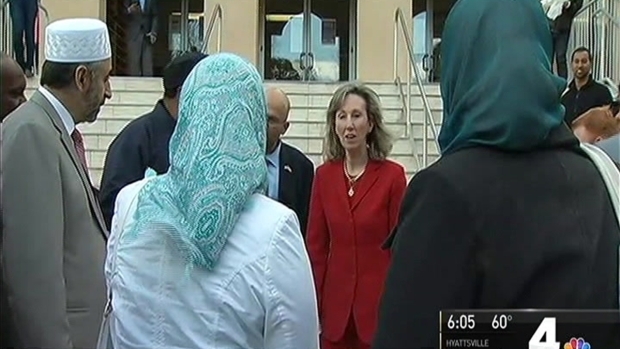 Many attendees of the mosque, which is one of the largest in the D.C. region, told News4 last month they worry Trump will ban Muslims from entering the country.